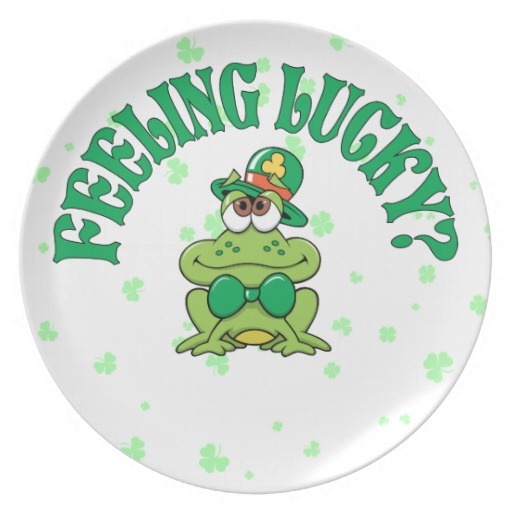 If You’re Lucky Enough to Be Irish…. And even though St. Patrick’s Day has passed, there’s some St. Paddy reporting to be done!! 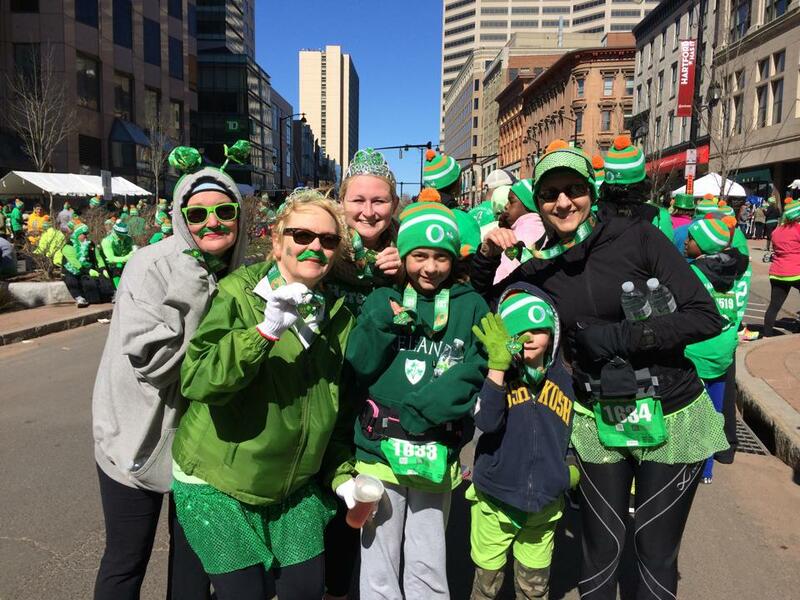 Each year, the Hartford Marathon Foundation puts on the O’Races! 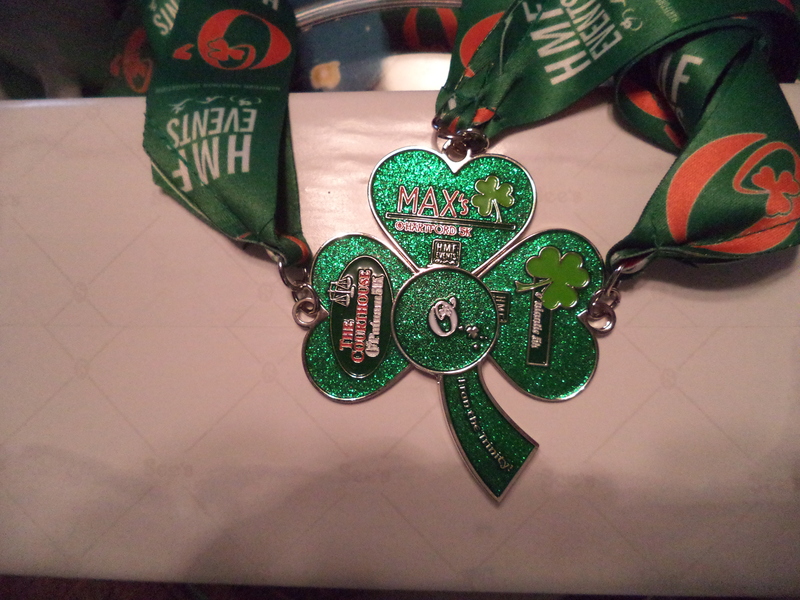 This year, as an added bonus, they added medals. 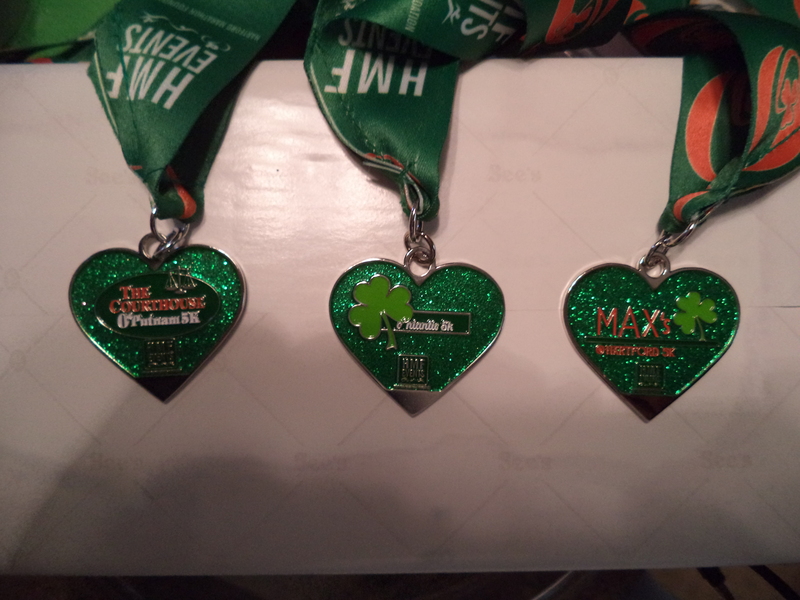 And at the end of it all, if you did all three races, you’d end up with a fabulous “key” to put all of the medals together. So…of course I was doing all three!! 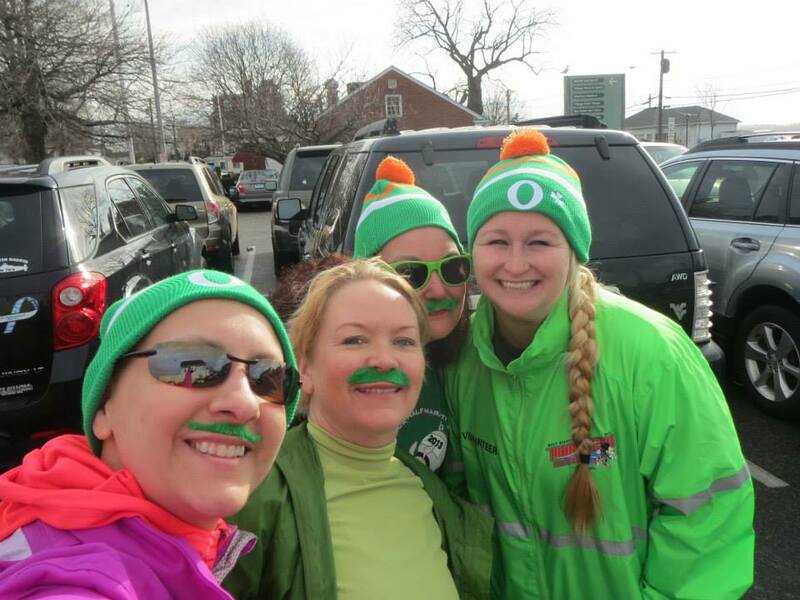 First up was the O’Putnam – the weekend BEFORE the weekend before St. Pat’s Day. Now, Putnam is way up in the Northeastern part of my tiny state! My friend Kim – at Maker Mother Marathon Runner – had just had surgery and was told no big driving so we were going to met at my house and drive up together. So, of course, minutes before she got here (luckily since I had told her the WRONG STREET!!) I went to pull the car out of the garage and it wouldn’t start!! I felt AWFUL – but Kim happily agreed to drive and we decided if she was not up to driving back then I would take care of that. So after what seemed like a bazillion years, we finally made it up to Putnam, grabbed our bibs and super great hats and decided to hang out in the sponsoring bar to wait for the start. Kathy was coming over from RI and had a much shorter drive. We ended up meeting her at the starting line. By the way, Putnam is a really cute little town with a great bakery/coffee shop and a dive bar or two! Me and Kim, reppin’ the Sparkle Athletics! 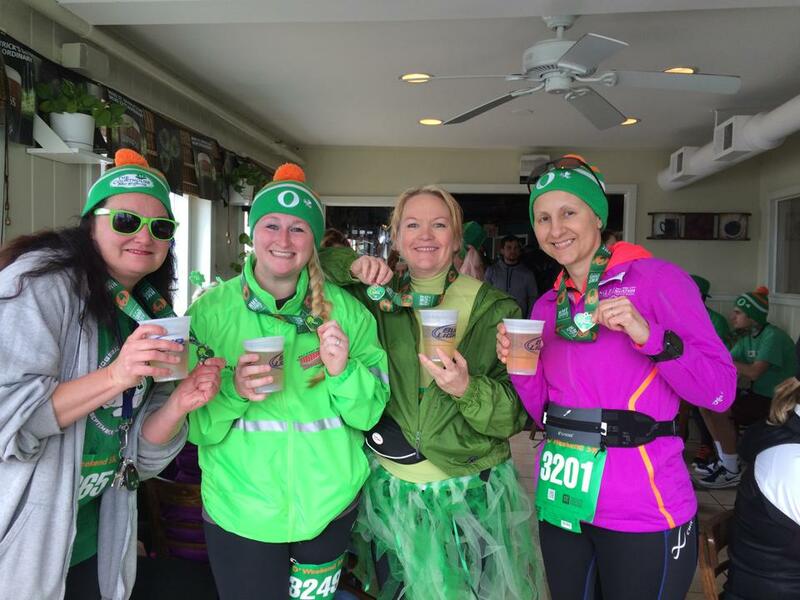 Now, these St. Patrick’s Day races all have one thing in common — that’s right. Beer. Not green beer. Just plain old beer! And, you’d be surprised (or maybe not!) how tasty a beer tastes at x o’clock after a short run! 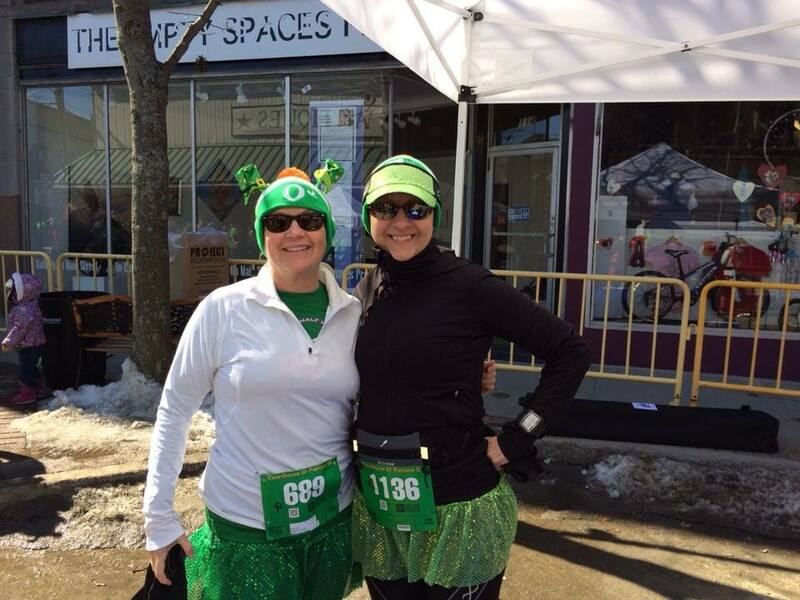 They were also offering corned beef sandwiches but I passed on that for this race. After chatting with Kathy and her husband for a bit, and getting in some dog petting, Kim and I headed back home and I can’t say enough how much I appreciate her driving when she thought she wouldn’t be!! The big weekend is actually the one closest to St. Patrick’s Day is the biggie. A 2 5K weekend! 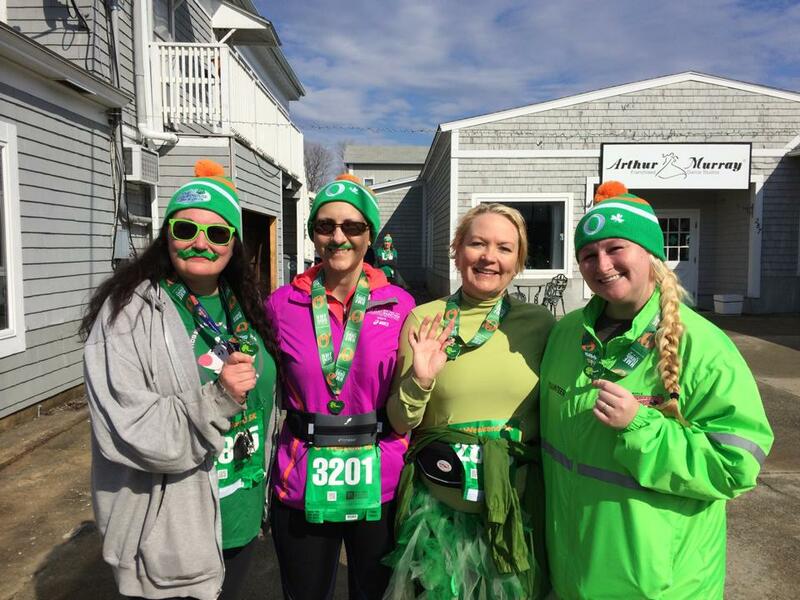 Pre-Race hijinks with Meg, Kim and Kathy! First up – the O’Niantic in…Niantic CT — down on the shore, it’s a cute little town. Kim and Meg (we met her before at Princess but in case you forgot, you can find her at Runaway Royalty — and definitely check out her recap of this weekend! Link down below!) came to my house since it’s really on the way down south and we headed down to the shore. We were there early, got bibs and hats (I missed out on this one -BOO!) and then went to sit in Dunkin to pass the time. Kathy met us there and we eventually headed to the start line (via the potties – which we ended up asking a store owner if we could use his and he kindly let us!) where there was not a lot of waiting for things to get going! Showing off some more bling! And our great caps! Kathy finished, then Meg finished and it made me happy to see her face when I headed across the finish line – then we waited for Kim, who wasn’t too far behind me! Again, St. Pat’s = Beer so we headed to the After Party at a local restaurant! Today our snack offerings were chili, bananas and some fantastic granola! Which was good to have while we waited in Line. For. Beer!! ‘Tis the season…the beer season! Eventually got a beer and found a place to keep warm and enjoy our beers before heading home again! Kathy was gonna spend the night instead of going home so we grabbed a(nother) beer and watched some DVR’d shows before going out to lunch at the diner around the corner. It was an EARLY night – cause we’re old and it had been a long day! On Sunday, we were happy that the race wasn’t starting until 1 in the afternoon. After a relaxing morning and breakfast we headed downtown. Where it was FA.REEZING! Seriously, with the wind it had to be in the 20’s. Thank goodness for another knit hat!! We met up with Kim (and her kids!) and Meg in the XL Center, out of the wind but eventually had to head outside. Hey! Where are you? I’m outside in the green cap!! 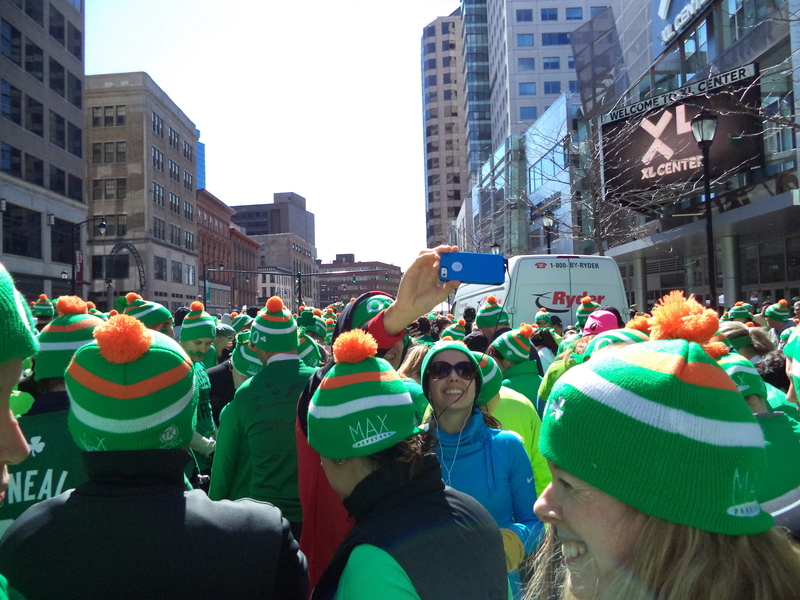 This race is the biggest of the whole series and it was a sea of green out on Trumbull. Today we all started separately, knowing that we’d meet up at the finish! I had a fun time, and did a little better than the day before. Slow and steady — I think that’s what will help me improve and get back to where I used to be! The sun was shining and once we got moving it warmed up pretty well. 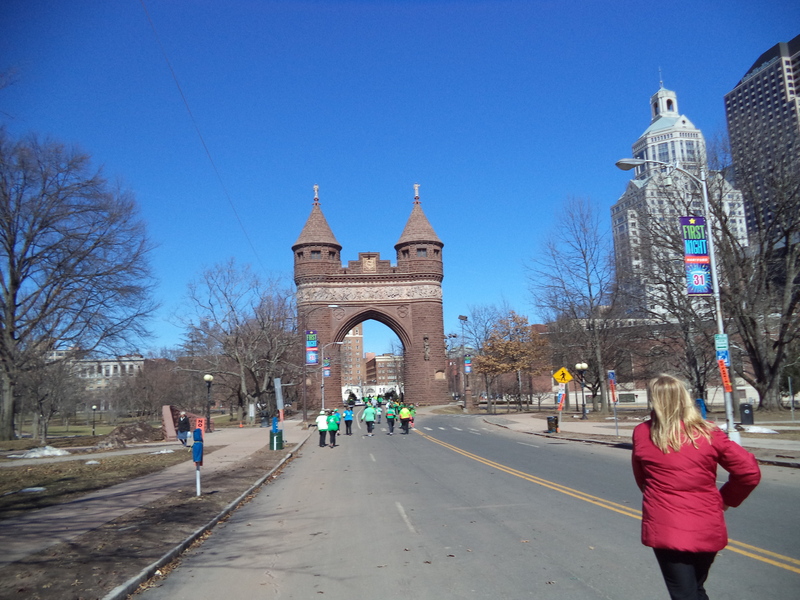 Lots of people out on the streets of Hartford made for an interesting run too! 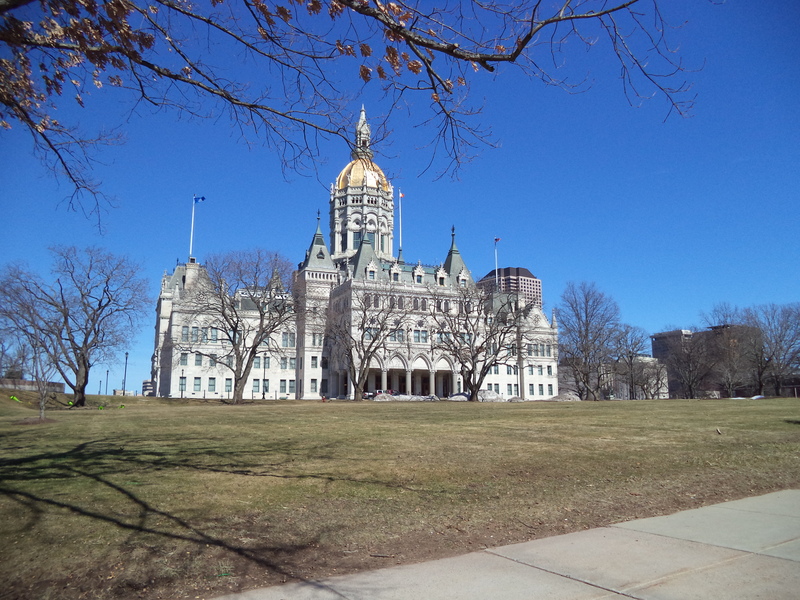 The State Capital — in the right light that dome is BLINDING! I love this arch — love it! Crossing the finish line, I saw Meg in the food line and got a text from Kathy that she was picking up my medal “clip” — see, for the first time ever, for the three O’Races, Hartford Marathon Foundation gave out medals – and at the last one, we got a clip to hold all three together! And when you put them all together…gorgeous!! Really fun and some nice Bling! Kim and Kathy eventually got in line with Meg while I grabbed my beer and then joined them. We grabbed our corned beef sandwiches and tried to find someplace indoors — trying the XL Center and immediately getting kicked out so they could lock up! Kim ended heading to her car while those of us who didn’t bring our kids (that we don’t have!) headed to the nearest pub! Had a great time having another beer and chatting with the girls – eventually though, even the most fun weekends have to wind down and that’s what happened to this one. I will say though that I had the MOST amazing time! I’m generally a lone runner but it’s always nice to know you’ve got friends out on the course and, in my case, waiting at the finish! I loved the weekends’ races and can’t wait to run with my girls again!! And for ANOTHER great recap of our weekend check out Meg’s blog at Runaway Royalty – she’s got some great pictures too! What a fun race with some super fun people. So jealous and man its cold up your way! Nice recap!